Winemaker’s Notes: Yellow color. Apples, lemons, and pears aromas. Medium to full body with medium acidity and creamy palate. Pair with pasta with cream based sauces. My Review: Chardonnay is hard sell in my house, especially Chardonnay that’s been oaked, so I went in assuming that this was one that I would be enjoying on my own, since my wife really doesn’t like oaked Chardonnay, and “Reserve” is usually a good keyword indicator that there’s oak involved. We were both surprised. In the glass the wine was a golden yellow, and on the nose I picked up citrus notes of lemon. In the mouth, the wine really surprised me. The wine has absolutely been oaked, but this is how oaking is supposed to be done – it added character to the wine without hiding flaws. I picked up flavors of lemon on the front palate which faded to a meringue/creamy note in the mid-palate, before finding a touch of acid on the finish to give the wine a slightly lingering finish, but not one that just sat on you. I just sipped on the wine by itself, but pairing this with any cream sauces would be great. This is also one to keep in mind for those last-minute Thanksgiving and holiday purchases – it’s well priced, but versatile enough to suit a number of different palates. 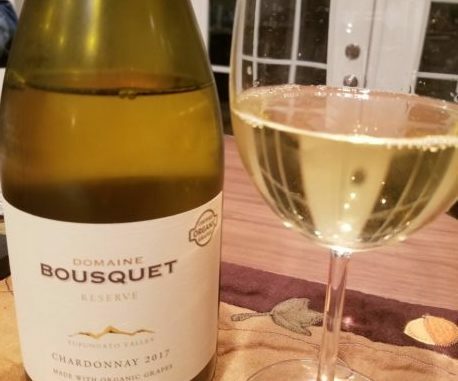 Like I said above (and several times before on other posts), oaked Chardonnay usually doesn’t find a warm welcome in my home, but the 2017 Domaine Bousquet Reserve Chardonnay is one guest I wouldn’t mind seeing again.